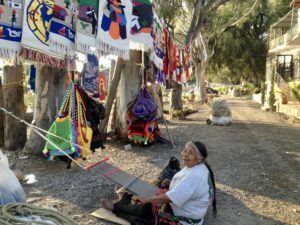 A passerby who views Conchita calmly weaving at her backstrap loom in Ajijic, Mexico has no idea of the athleticism and fortitude required of this Oaxacan elder on either end of her working day. The slideshow below shows Conchita constructing her outdoor “store” along the shore of Lake Chapala. Prepare to be amazed.